Godfrey's Mama: "Do You Remember His Name?" I went with Briana and Dylan last week to The Aquarium of the Pacific in Long Beach. We had a great day watching all the sea creatures. The sea lions were especially fun to watch. 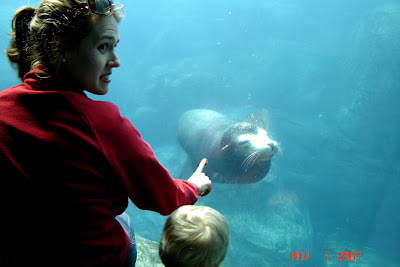 One of the docents told Briana that the sea lions are attracted to quarters if you hold one up to the window. They will come up to investigate like this one did. After a few minutes of sea lion watching, another docent came up to us. She did not approve of the quarter technique. For a brief moment, I thought the quarter incident might get us into some trouble. But, then these three came in to look at the sea lions. I figure if they don't throw you out for being stoned or stupid or both...they certainly won't throw you out because you held a coin up to the window.